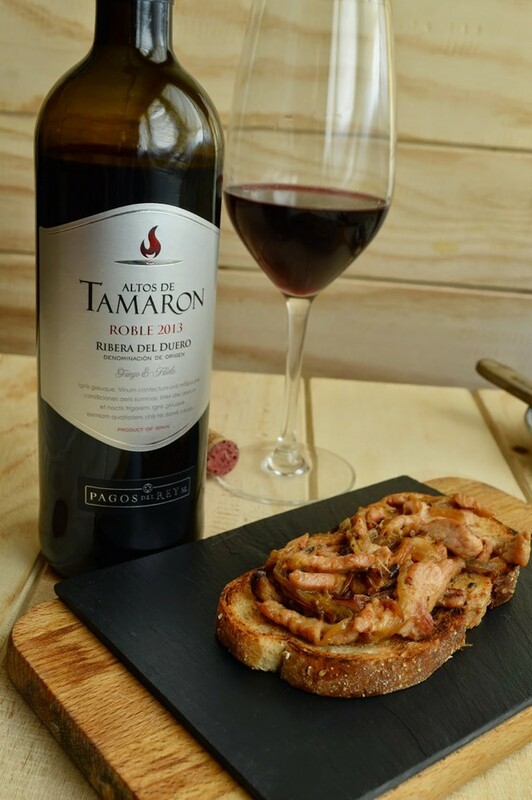 In the blog de Las recetas de Noelia, the blogger share this easy recipe, an delicious piece of toast to enjoy with Altos de Tamaron roble, one of our wines from DO Ribera del Duero. This recipe is intended for a light meal or a quick dinner that anyone can cook. Start by warming a pan. Spread the butter on the bread and heat in the pan. Take out when they are ready. In the same pan, use a spoon of olive oil and fry the onion in very thin slices. Fry at medium heat for around 15 minutes. Add the turkey cut in slices, and move. Add a mince of salt. Cook for around 5 minutes. In a separate pan, add a spoon of butter and blue cheese cut in dices. Move in medium heat, until it is creamy. Add the cream and continue stirring. This is ready to add into the pan and move for another 5 minutes. Serve the mix on the pieces of toast. Open the bottle of wine and enjoy.